Here’s how to cook acorn squash. 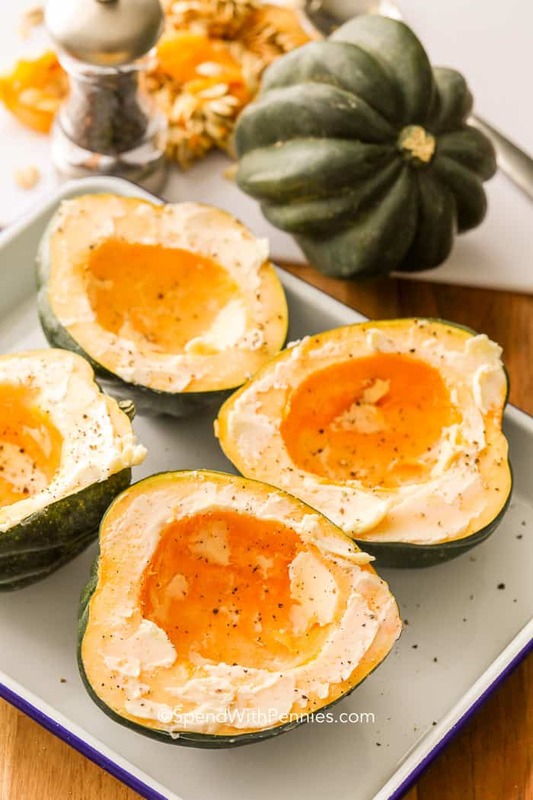 Cooking acorn squash is so easy, you’ll wonder why you haven’t experimented with this healthy powerhouse of flavor and nutrition! With a little know-how and a few prep tips, acorn squash will be a regular on your menu rotation all through the summer and into fall! There are so many tasty squash recipes like Butternut Squash Soup, it’ll be hard to find a favorite! A good acorn squash should look deep green in color on the outside and feel heavy in your hands. Avoid squash that are cracked, mushy or leaking. There should be a slightly sweet smell at the base. Place the acorn squash on its side on a kitchen towel over a sturdy work surface. The towel will help keep it from slipping away while it’s being cut. Using a sharp knife, position the blade between one of the ridges at the top and gently ease the knife through the thick part of the flesh until you reach the hollow center. This may take some muscle, and don’t be afraid to reposition the knife as necessary. It’s okay to turn the squash over and cut from the top of the stem there as well. Typically, the stem will remain with one of the halves. Once the squash has been fully cut through, pull apart the two halves and scoop out the stringy pulp and seeds (you can bake the seeds the same as Roasted Pumpkin Seeds)! 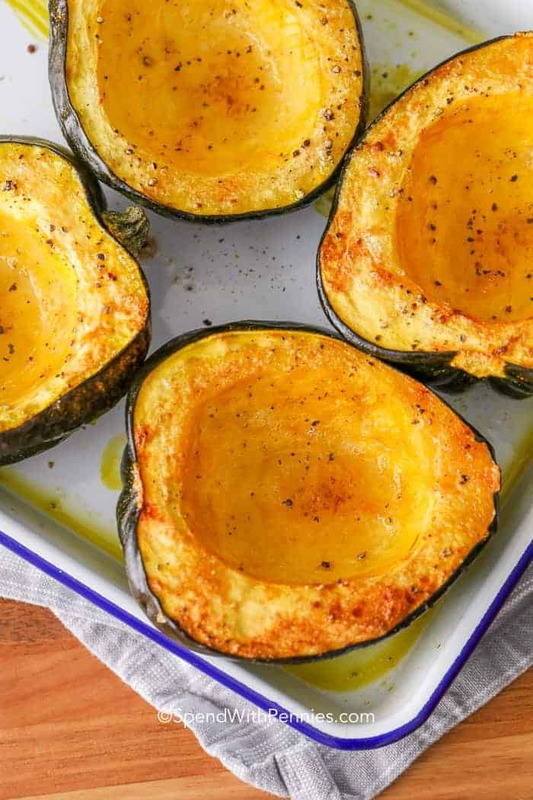 Now you’re ready for baked squash! 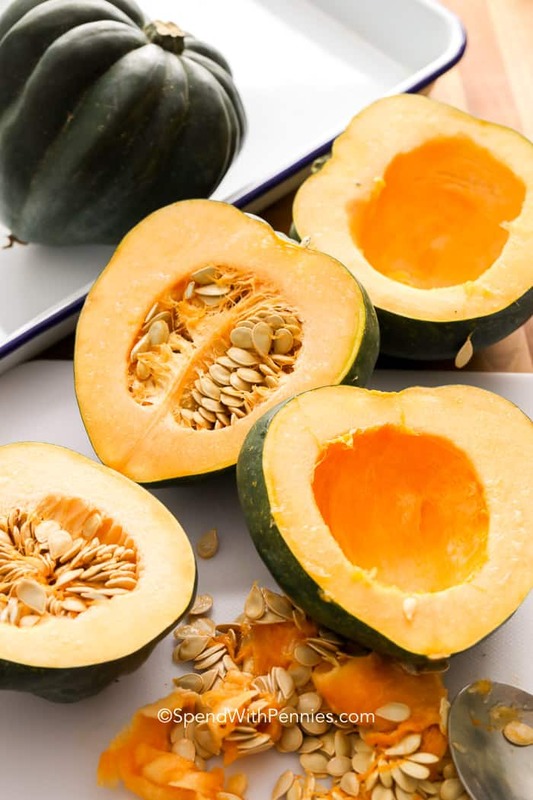 Here’s how to cook acorn squash so it comes out perfect every time. Roasted acorn squash is a vegetarian’s dream because the sweet, mild flavor complements so many other things like beans, nuts, and cheese. Stuffed acorn squash is often found on menus in vegan restaurants because it is easy to popular and easy to prepare as an entire entrée but it’s also amazing stuffed with ground beef. Roasted acorn squash is a cinch! Just oil and season each half, and place, flesh side up on a greased sheet pan and bake for 40 to 50 minutes at 400°F. Once fully cooked, the roasted squash can then be used as bowl or the flesh can be scooped out and served! Cut acorn squash in half. Using a large spoon, scoop out seeds and pulp and discard. Place squash in a shallow baking pan cut side up. Rub with butter and sprinkle with salt and pepper (and brown sugar if using). Roast uncovered (flesh side up) for 40-50 minutes or until golden and tender. For a sweeter version, sprinkle squash with brown sugar before roasting.